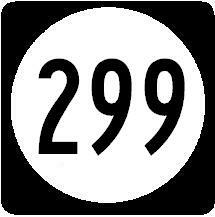 Delaware State Route 299 runs east-west across Southern New Castle County. 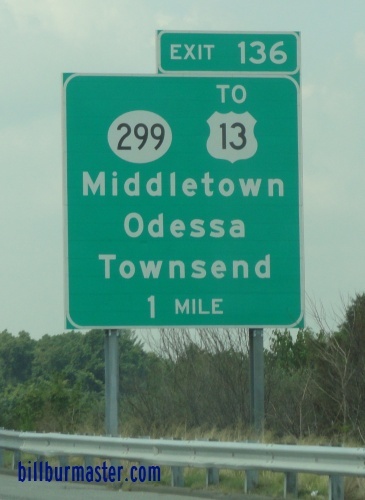 It goes from Delaware State Route 9, near Odessa, to the Delaware/Maryland State Line, near Middletown. DE St Rt 299 passes through the following towns in New Castle County. DE St Rt 299 is multi-plexed in New Castle Couny. Delaware State Route 15, at Middletown. U.S. Rt. 301, near Middletown. DE St Rt 299 intersects the following highways in New Castle County. Delaware State Route 9, near Odessa. U.S. Rt. 13, at Odessa. Delaware State Route 1, at Odessa. Delaware State Route 15, at Odessa. U.S. Rt. 301, at Odessa. U.S. Rt. 301, near Odessa. A BGS on SB DE St Rt 1.